The Glen Mar Green Team is a group of youth and adult volunteers that will work on Glen Mar members’ projects to earn money towards the cost of a Glen Mar mission trip. Tasks include: yard work, power washing, gutter cleaning, painting, deck sealing, demolition, light construction, trash removal, lawn mowing, mulching, weeding, leaf raking and removal, window washing, and other such tasks. Most Green Team projects are completed on Saturdays from March to November, and are between 2 and 7 hours in duration. The youth are trained in skills that they may encounter on mission trips. The monies are divided equally among the crew at the completion of the project. To offset an individual’s mission trip costs: Each crew members' portion of the monies are placed in their Glen Mar family account, to be used to finance any mission trip. To help families in Hurley, VA, where Glen Mar youth travel annually on mission trips: 10% of the Green Team’s gross earnings are deposited into the “GT Gift Card Fund,” which is used to purchase Walmart gift cards for families in Hurley and to purchase items to stock the Hurley Food Pantry. This was the idea of the original youth involved with the Green Team and has now become standard operating procedure. Contact Tom Pirritano using the form below (* indicates a required field). The Green Team is open to youth who are currently in the 8th grade or older, and any college student or adult. College aged members perform jobs when they are home on fall, winter, and spring breaks. Youth must have parental permission. Individuals over 18 must first have current Safe Sanctuaries training including a background check. You can designate YOUR gift card rebates for the GT Gift Card Fund! Visit the gift card table in the Gathering Place for details. 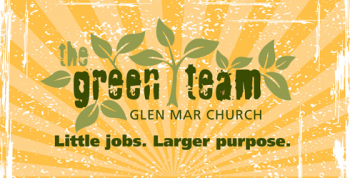 Send an email to greenteam@glenmarumc.org or call Tom Pirritano at 443.277.1242.